Last time we took a little bit of a different approach to things by looking at a game that was mostly unchanged between regions. This time, we're going to look at yet another different type of game: one that was originally English and then localized into Japanese. Today, let's take a look at a game I've loved since I was a wee lad: Myst . Myst has had quite a number of ports and versions over the years, but for simplicity's sake I decided to take a look at the differences between the English and Japanese versions of the Saturn release of Myst . Myst is a puzzle adventure game developed by Cyan, Inc. and released in 1993 for the Macintosh. In 1994, a PC version was released, follow by ports and rereleases on a number of different platforms. 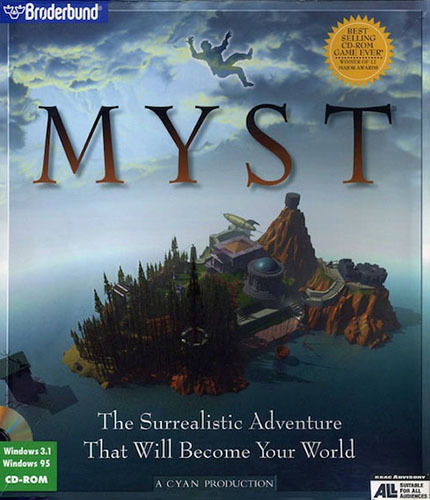 The Japanese version of Myst was released in 1994 on Mac, PC, and Saturn, with ports to other platforms coming later as well. 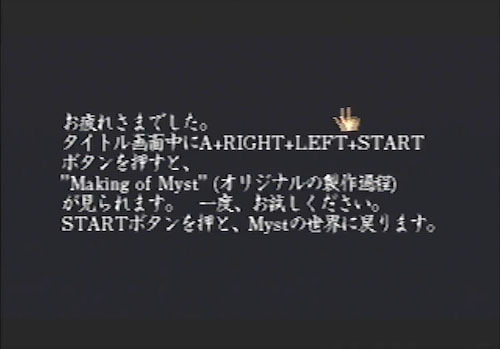 The Myst series has a total of six games, and as far as I can tell, five of those were localized into Japanese (Uru seems to not have had a Japanese version). 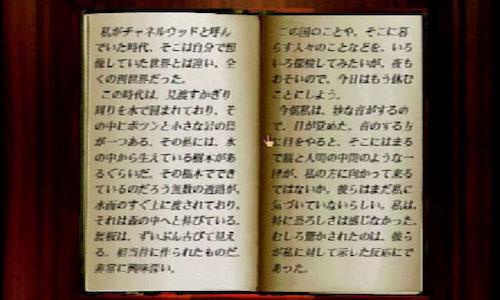 There was also a series of three books written to expand the Myst backstory, and amazingly enough the first of these - The Book of Atrus - was actually released in Japanese as well! それなりに有名な「MYST」のパッケージイラスト / The famous box artwork for Myst. 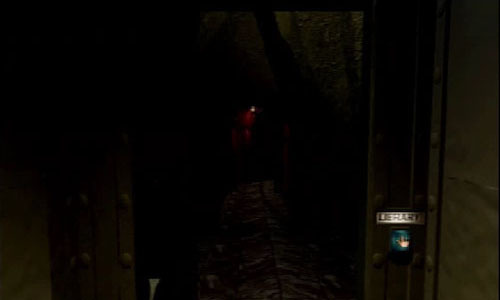 The game at first glance appears to be 3D, but is in fact simply made up of a series of pre-rendered images the player can travel between. Essentially, when you click the screen to travel, it appears as if you're moving within a 3D space, but all that is actually happening is a transition between still images. 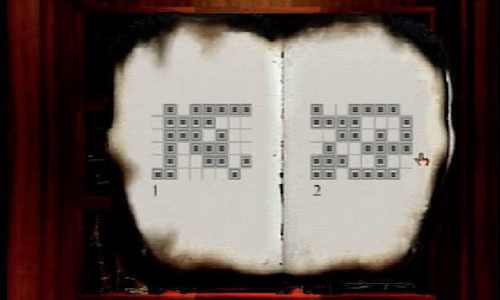 The player progresses in the game by solving puzzles and finding hidden books which allow them to travel to other worlds, known as "Ages". There's no tutorial or anything, and you're thrown right into the game without knowing what to do, so it has a significant air of mystery to it. Other people do appear in the game, and they are all in the form of full-motion video sequences (with characters being portrayed by members of the development team), lending a sense of realism to the game. 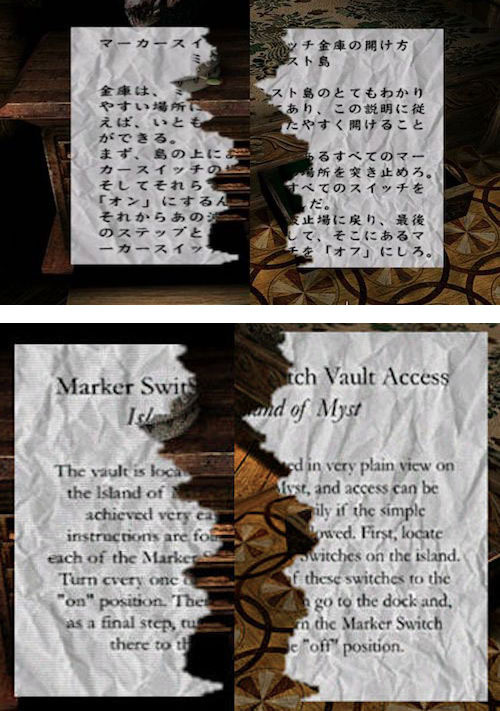 There's quite a lot of text in Myst, so this time, rather than looking at the translation itself, let's take a look at the methods used to communicate the translated content. But before that, there's a slightly more important thing we should talk about! You may have already noticed, but the title "Myst" actually has a couple different meanings. Probably the most obvious is that it's a slightly altered spelling of the word "mist". There's a lot of mist and fog in the game, giving it a lonely, isolated atmosphere, so this makes sense. 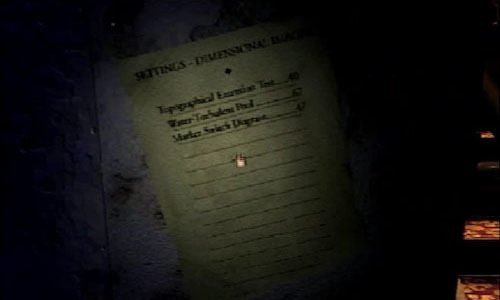 "Myst" is also likely short for "mystery", which is also extremely fitting for the content of the game. In some places on the Japanese release it's written in katakana as ミスト, but I was pleased to see that for the most part they keep it in English as MYST. When I started doing research for the article, I figured the Japanese version would just have subtitles for the video portions, but it's actually fully dubbed! It probably shouldn't be all that surprising, given how big the game was when it came out. Both the tone of voice and speaking style of the Japanese dub for this character (Atrus) give off a kind of "wise man" vibe, and it's close, but feels a little off. Atrus as portrayed in the English version is more akin to a historian, and if anything is kind of like a fatherly figure rather than an older character. It's no surprise to see that the note has been translate for the Japanese version. It says pretty much the same thing, though the Japanese version uses the phrase "secret room" rather than "forechamber". Atrus's name is written as 「アトラス」, which (while close to the English pronunciation of "Atrus") actually equates to the word "atlas". Also, Catherine is a pretty common name, and isn't changed in Japanese, but I couldn't help wonder if maybe the name reminded any Japanese players of Birdo from the Mario series, who is called Catherine in Japan. These are instructions for calling up certain things on a holo-imager, and for whatever reason they're left in English for the Japanese release. It's not exactly important information, and while there are some complicated words that might be fairly difficult to translate, that in itself makes leaving it in English even worse! Not only that, but thanks to the low resolution of the Saturn's graphics, it's hard to read even if you do know English, so I can't imagine how Japanese players must have reacted. 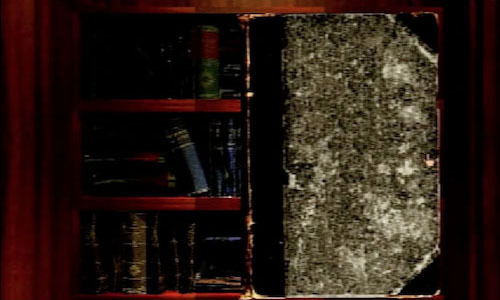 As I mentioned before, there's a loooot of text in Myst, but actually, over 90% of it is contained in the books in the library. 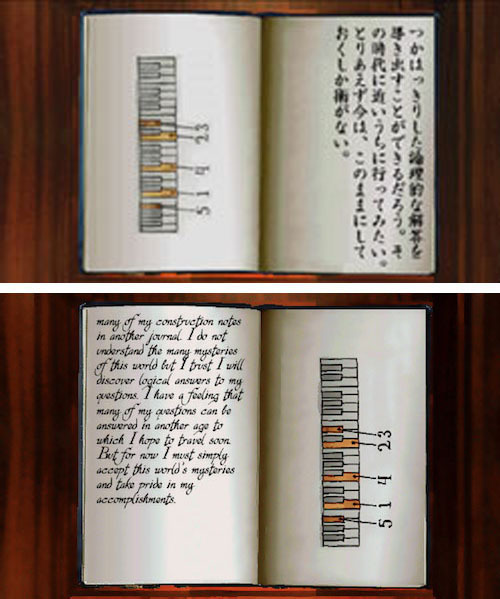 I assumed the books would be translated, but what I didn't expect was for them to be converted to the Japanese top-to-bottom, right-to-left style of writing! It's an especially surprising length for them to go to, given that it required not only changing the content of the books, but the direction of the page-turning mechanic as well. I think what it is is that, in English we can arbitrarily capitalize regular nouns and turn them into proper nouns, giving them the feeling of a slightly changed meaning. I'm not sure if there's a direct equivalent to this in Japanese, but if there is, it isn't being used here, so the naming ends up seeming just a bit off - as though you're actually traveling to different time periods, when in fact time doesn't actually have anything to do with it. The one issue with changing the writing style is that they didn't change the image for when you pull a book off the shelf, meaning that for the Japanese version you're actually looking at the back of the book here, haha. 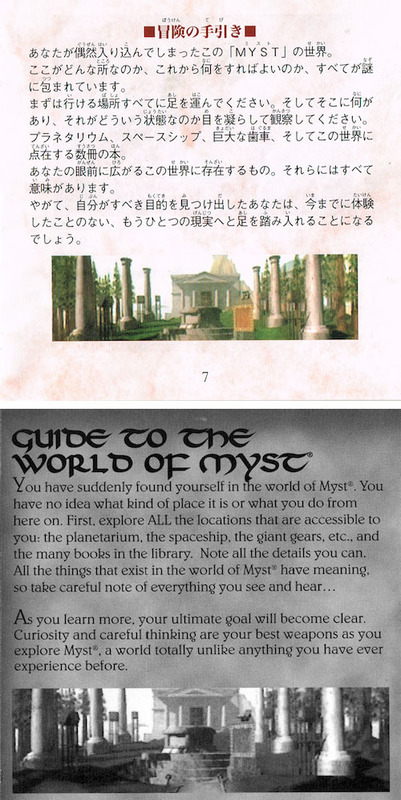 Oddly enough, I took a quick look at the Japanese PC version of Myst, and while the translation content is exactly the same, the books are presented in western writing style. Go figure! The basic flow of the game is that you visit the various Ages to find red and blue pages and restore them to these books. Every time you add a new page, you receive a short message from the person trapped inside the book (Achenar is in the blue book, and Sirrus in the red). Like Atrus and Catherine, these characters' names are unchanged for the Japanese version. Achenar's name pronunciation 「アクナー」("akunaa") seems slightly off; however, this might be intentional - 悪 ("aku") means "evil", and Achenar is quite the bad dude, so there may be some wordplay going on here. Incidentally, I felt like the Japanese dubs for both the brothers were pretty well done! The text here is in English in both versions, but it's pretty simple stuff so not that strange. 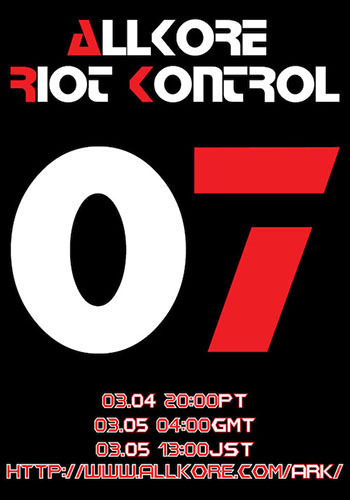 This is a hint for one of the puzzles, and the dates are left in English and western format for the Japanese release. You pretty much have to enter this information as-is in another location to solve the puzzle, so changing the format may have caused issues with that. Still, the date format should be pretty easy to figure out regardless - it just caught my eye that it was unchanged. 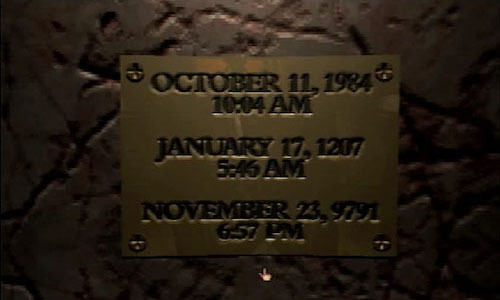 The two halves of the note are hidden in different Ages, so you have to find both to figure out the puzzle's answer. It's not exactly surprising, but it is nice to see that they translated it into Japanese in such a way that the answer still wasn't understandable without finding both halves of the note! This book contains a bunch of codes, one of which is necessary to solve a certain puzzle. After looking at the other books, I wondered if this one would be right-to-left in the Japanese version like the others, but it ended up being left-to-right like in the original English release. I don't really have anything specific to say about it, but here's the ending and credits for the game in Japanese. It's pretty spoilery (even in a different language), so if you haven't played the game yet and think you might, it's best not to watch it! 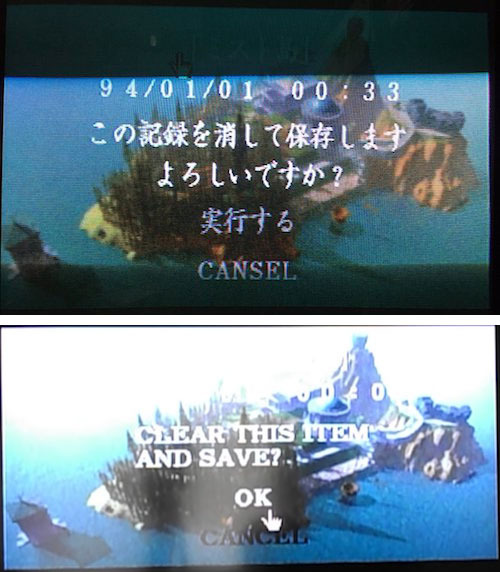 As an aside, the credits don't roll in the English Saturn version until you manually quit the game yourself. This little message pops up after clearing the game. The Making-Of video was included in the English PC and Saturn versions, but it's in the Japanese release, too?! At first, I thought that since the actors in the game were members of the development team, they might have the same voiceover actor in the making-of video. It turns out that nope, it's just a female voice narrating for the entire thing. There are some very tiny differences, but the translation here is pretty much spot-on. Amusingly, this text appears in THREE different places on the Japanese packaging, whereas for the English version this is the only spot it shows up. Just a small interesting difference - the Saturn mouse wasn't released in the US, so it's not mentioned in the English manual. Not too many differences here. I did find it interesting that despite the Japanese manual being color and the English manual being black-and-white, the screenshots seems to be of higher quality in the English one. The "Pillar Walkway" is simply called the "Garden" in the Japanese manual. The description for the generator is a little more detailed in the Japanese manual, also mentioning that there are two breaker towers nearby. The Japanese manual has an entire extra section of hints and tips that's not present in the English one. Instead, the English manual has ten whole blank pages for you to fill in your own notes while playing the game. It's interesting to see the different approaches for each version at trying to help the player out! Pretty much all the releases of Myst feature this same cover art. The Myst soundtrack is mostly mellow, ambient stuff, and unsurprisingly there not really anything even vaguely nerdcore-related that samples it. Instead, I've got an announcement to share! After a three year wait, the next Allkore radio event is here! We've got a lot of great artists participating, so you won't want to miss this! Check out the official site for all the details! Last year Cyan released a spiritual successor to the Myst series, Obduction. I don't have a computer quite powerful enough to play it, but they've announced that it's coming to PS4 with PSVR support, so I'm super excited for that! Also, I'm planning on taking a short break from game localization and doing an article about something a little different next time.